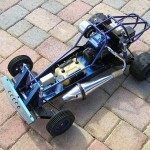 Over 20 years ago I got my first Raco Jac-Rabbit 1/4 Scale RC Car. It was the most fun I ever had in the RC hobby. I was immediately hooked on large scale and especially gasoline engines. The pricing of the car was fantastic for it’s time, As long as you did not buy it from The Sharper Image catalog for $1200 +. You could buy a basic entry model from around $550. I still have a Raco price list from 1993 and brand new directly from Raco they were $695. I loved the simplicity of the car. It was built extremely well and easy to repair. The car could take a beating, although could not handle the jumps that you see the 1/5 scale cars handling these days. They came with Zenoah G2D two stroke 23cc engines that with little or no care seem to last a life time. They were easy to start and had plenty of power. Using gasoline meant you were only limited by your on board electronics battery. You could run all day almost non stop if you brought an extra battery and charger. I never got into any of the other 1/4 scale RC cars. I did not race. I just loved to find a great location to run the Jac-Rabbit like crazy. A few years ago after many years of use I finally broke some parts due to a run away Jac-Rabbit. I guess I had not kept up with the times as many advancements had been made in the RC world as far as emergency kill switches 🙂 . That was partially the Jac-Rabbit’s fault. I never had any problems in over 20 years. I was still using the original Futaba Radio I put in the car and had never broken anything. 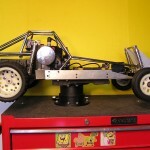 The only thing I bought after initially building the car was higher capacity on board batteries. Unfortunately, Raco went out of business sometime around 1997. So the search began for replacement parts. After some searching it became apparent that used Raco parts could be found on Ebay or the best 1/4 scale web site out there. quarterscalelegends.com You have to watch and check every day, but you could find them. Finding brand new parts was much harder. I decided to build my own parts out of aluminum instead of buying used plastic parts. They came out great and I had quite a few requests to make them for others. I did a small run of Shock Tower Kits that sold pretty well. I then made a second larger run and still have stock available. Unfortunately the manufacturing process is very expensive, so the end product price is high with a very low profit margin. I did this more for the love of 1/4 scale than to make money. I also started buying Jac-Rabbits off Ebay that were in various stages of condition to restore. I will post some sub pages here. 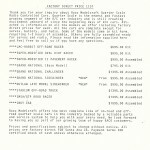 One for complete Jac-Rabbits that are available for sale and another page of Jac-Rabbit parts that are available for sale. I am also working on building a Jac-Rabbit that will never be run, you will see why in the Jac-Rabbit build Page. 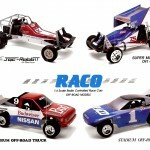 Here are some flyers of Jac-Rabbits and other Raco cars. 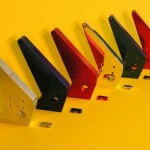 I have lots and lots of old Raco Jac-Rabbit parts to sell. 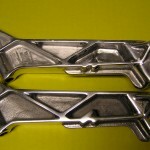 I also have some New Old Stock Raco parts. I will have to start getting the parts out and taking photos. For now, I will post the brand new parts I have made. Here I will keep photos and descriptions of all the complete Raco Jac-Rabbits I sold. Unfortunately I sold quite a few before I started this web site and I don’t think I saved the photos. If I come across photos of those cars I will certainly post them.